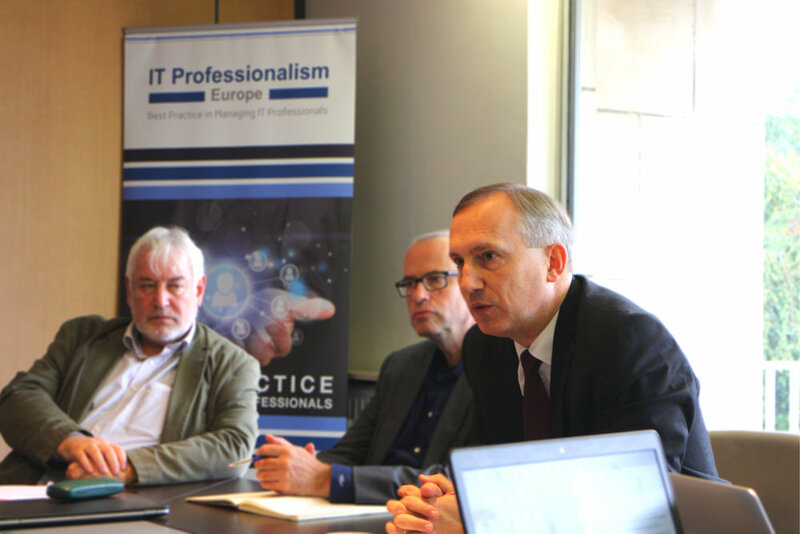 On 5 October, approximately 20 members of the IT Professionalism Europe network gathered in Brussels for a roundtable discussion on the European e-Competence Framework (e-CF) in practice. The event brought together key stakeholders from the European Commission, industry, non-governmental organisations, and academia for an exchange of experience of using the e-CF, and to discuss challenges and potential ways of cooperation to further the cause of IT professionalism. The event was opened by Luis Fernández-Sanz of the CEPIS Board of Directors, who gave a warm welcome to participants. 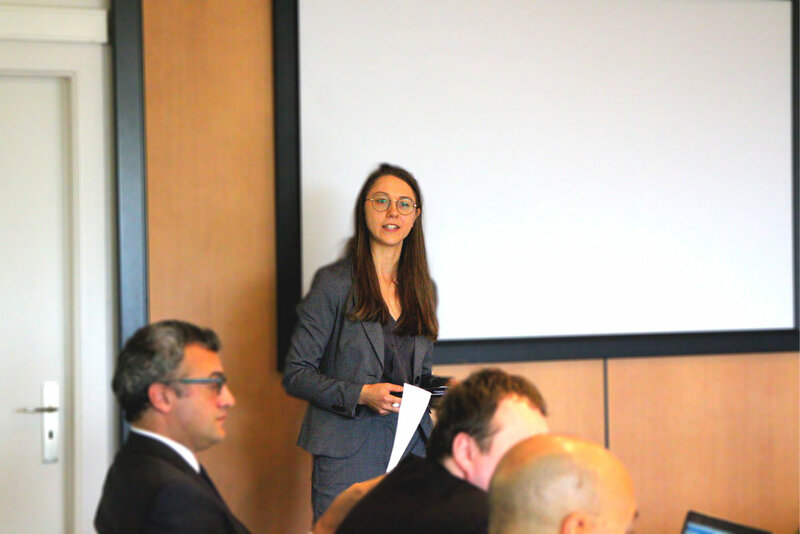 Dr Fernández-Sanz was followed by Jakub Christoph who gave a recap of recent ITPE developments. After a short update on recent ITPE activities, André Richier from the European Commission’s Directorate-General for Internal Market and Industry presented the Commission's agenda on IT professionalism. Mr Richier stressed that ICT Professionalism consists of four building blocks: a body of knowledge, a competence framework, education and training, and a code of professional ethics, each of which are very important. He also informed the event participants about the development of e-CF 4.0 and invited them to get involved in the process. Mr Richier's presentation was followed by Mary Cleary, Chair of the CEN Workshop on ICT Skills, who gave an update on CEN and TC428. Then, the event opened up to presentations of other participants and a roundtable discussion on thoughts and experiences with the e-CF as well as next steps in promoting the IT professionalism agenda. Mr Christoph’s explained that ITPE is a network of organisations committed to furthering IT professionalism in Europe. He updated participants about the latest members to join the network and noted that, with the most recent additions, ITPE has already met its Digital Skills and Jobs Coalition pledge to have over 50 members by the end of 2018, with membership currently over 60. Mr Christoph then gave an overview of previous ITPE Briefing Series events and encouraged members to contact ITPE to arrange a briefing event in their home countries, to expand the awareness about ITPE across Europe. He concluded the presentation by reminding that ITPE is committed to a holistic approach and that, while ITPE supports the e-CF, IT professionalism encompasses not only competence development, skills frameworks and standards, but also crucial topics such as education and training, professional ethics and bodies of knowledge. André Richier addressed the attendees, gave a brief overview of IT professionalism in Europe, and explained the previous attempts to establish a meta-framework. He noted the importance of focusing on furthering IT professionalism within the European internal market to enhance the skills of the European labour force and stressed that the e-CF needs to be defined by the contributions of stakeholders. He continued to commend CEPIS as it has been very instrumental and active in the area of IT professionalism. Mr Richier encouraged the participants to identify the principal actors in their home countries interested in standardisation and encourage them to engage with their national standards bodies on development of the e-CF 4.0. He also noted the importance of the ITPE network to bring together organisations concerned with furthering the IT Professionalism agenda. Mr Richier ended his address by stating that DG Growth is open to engage with all stakeholders on these issues. Mary Cleary addressed the event and gave a brief overview of the CEN Workshop on Digital Skills, a network of expertise in the area of ICT skills. Ms Cleary noted that, while TC428 will be the engine to drive standardisation efforts and manage the work output, all stakeholders should have the opportunity to provide input in this process. Ms Cleary expressed her opinion that ITPE has a great potential to keep advancing the IT professionalism agenda and to communicate its members’ feedback to TC428. After the presentations, the event opened up to a roundtable discussion that focused on using TC428 as the primary engine to further a standardised framework and remaining open-minded to the avenues available to advance the IT professionalism agenda. Participants agreed that a considerable degree of the e-CF's success would depend on how it is marketed and up-taken by private organisations. At the end of the discussion, CEPIS restated ITPE's commitment to furthering IT professionalism and that it will keep an open mind for moving forward.